Despite the headline-grabbing record cold and snowfall in the eastern U.S., spring comes to the northern hemisphere on the heels of the warmest winter on record. According to the latest report from the National Oceanic and Atmospheric Administration (NOAA), the average global land and sea surface temperature for the period of December 2014 through February 2015 was 1.42 degrees Fahrenheit (0.79 Celsius) above the 20th century average of 53.8° F or 12.1° C.
“The majority of the world’s land surfaces, however, were warmer than average, with much-warmer-than-average temperatures widespread across Central America, northern and central South America, Australia, most of Africa, and much of Eurasia, including a broad swath that covered most of Russia,” the NOAA report states. 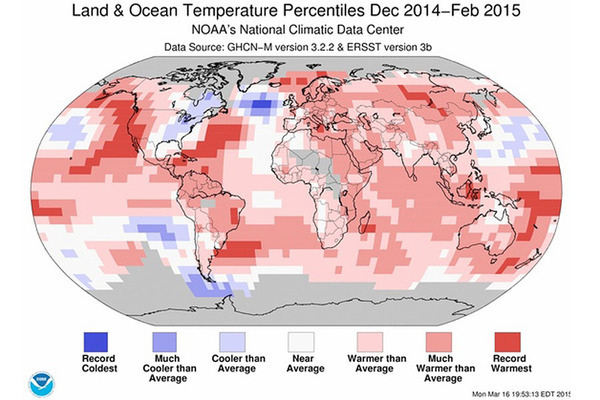 NOAA also reports average global land and sea surface temperatures for the month of February 2015 as the second warmest in the 136-year record, at 1.48° F above the 20th century average. The report further states that nine of the past 12 months “have been either warmest or second warmest on record for their respective months.” Last year was also recorded by NOAA, NASA, the Japan Meteorological Agency and the World Meteorological Organization as the hottest year on record. The data show an increasing trend of climate destabilization that calls urgently for action. Despite this, U.S. Congressional leadership continues to ignore, deny or resist any meaningful climate and energy policy, evidenced by Senator James Inhofe, the chairman of the Senate Environment and Public Works Committee, offering a snowball on the Senate floor as proof against global warming. It’s time to see the wild swings in weather trends, from record snowfall to record drought, as sure signs of a rapidly changing climate. We need leadership at every level of society, not snowball fights on the Senate floor.